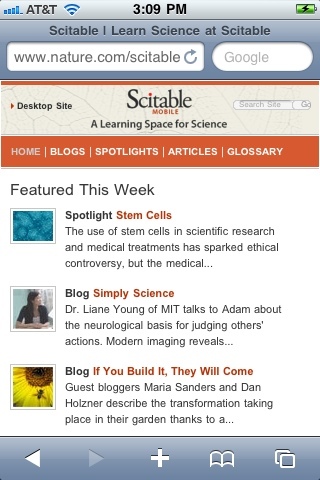 We covered Scitable.com, the social network for science education from Nature Publishing Group, back in May. At that time, I was told that a mobile-friendly version of the site was in the works. Today that mobile site is ready, as seen in the screenshot above. Scitable’s Vikram Savkar has been studying broadband adoption, and has drawn some interesting conclusions. Obviously one of those conclusions is that a science education site like Scitable isn’t a one-size-fits-all operation. As mentioned in our original review of Scitable, a large portion of the target audience that Scitable is courting may not have easy and regular access to a modern PC with a broadband connection. Instead, many will be using mobile devices. For example, on the iPad, users will experience essentially the same site that we deliver via broadband to a desktop device, but with iPad-friendly videos, audios, and interactivity. On the iPhone and Android, users get a new but still high-end site with presentation styles and navigation optimized for the form factor of handhelds. Users on mid-level phones get a simplified version of this, with lighter pages and streamlined media formats. And users on low-level phones have even lighter pages – in order both to drive fast page load and keep down data costs for the user – with very simplified navigation and presentation but full access to the core content. Not all aspects of the site have been made available to mobile users. For example, the community features — signing up for mentorship programs, the “ask the expert” feature, and building up networks of scientific colleagues — are not currently available to mobile users. The intent is to focus now on the content — articles, videos, audio, images, and blogs — and to make that as available as possible to students and teachers using a broad range of mobile devices. As the mobile site gains traction, the Scitable team will evaluate what other aspects need to be made mobile-friendly. Savkar told me that the development and release of the mobile site yielded some interesting potential benefits for the non-mobile site. For example, we’ve paginated all of our articles on the mobile site to make them fit better into the smaller screen, whereas in the original site they display full-size. I’ve come to feel that, since our content isn’t exactly light reading, pagination improves the usability in any context, by breaking ideas down into smaller chunks. So we may well roll that back into the desktop site soon. Clearly their work isn’t done, and by all accounts they’re committed to the process for the long-term, to ensure that their content is available to everyone. Cambridge, MA – August 25, 2010 – Nature Education, the educational wing of global science publisher Nature Publishing Group, today announced the launch of the mobile version of the open-access science library Scitable. Scitable’s free library of scientist-authored overviews of key concepts in the life sciences is now accessible to users on a broad range of mobile devices, including the iPad, Android, Blackberry, and basic feature phones. Scitable, launched in 2009, combines a library of science education resources in the life sciences with classroom management tools and a collaborative community of scientists, instructors, and students. For more information about Scitable, visit http://www.nature.com/scitable. Nature Education, the educational division of Nature Publishing Group, is dedicated to developing innovative science education resources for undergraduate and high school science students and faculty. Nature Publishing Group (NPG) is a publisher of high impact scientific and medical information in print and online. NPG publishes journals, online databases, and services across the life, physical, chemical, and applied sciences and clinical medicine, including Nature (founded in 1869), the leading weekly, international scientific journal, and Scientific American, the oldest continuously published magazine in the US and the leading authoritative publication for science in the general media. Online, nature.com provides over 5 million visitors per month with access to NPG publications and online databases and services. Part of Macmillan Publishers Limited, NPG is a global company with principal offices in London, New York, and Tokyo, and offices in cities worldwide including Boston, Buenos Aires, Delhi, Hong Kong, Madrid, Barcelona, Munich, Heidelberg, Basingstoke, Melbourne, Paris, San Francisco, Seoul, and Washington DC. For more information, visit www.nature.com.